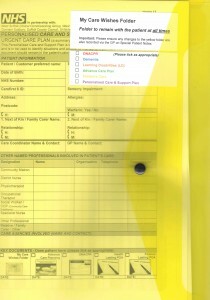 The My Care Wishes Folder is a development on the My Advance Care Planning documents (yellow folders) to help people plan for the care pathways they want in place much earlier than before. The yellow folders initiative was originally implemented to support individuals in the last 12 months of life. It holds key information such as the East of England (EoE) DNACPR and Advance Care Planning documents. My Care Wishes replaces the My Advance Care Planning documents and extends planning to much earlier in someone’s life, starting vital conversations earlier in an individual’s care pathway to allow patient/resident and family/carer to make choices around their preferred place of care and death. My Care Wishes also provides clear guidance on how an individual would like to be cared for in an emergency situation. Patients and carers have welcomed the chance to plan earlier, we have found in recent projects, and extending these opportunities will help the health and care system support people together. My Care Wishes also captures patient/resident wishes around further ‘active’ treatment and hospitalisation versus remaining in their usual place of residence and receiving palliative care/symptom control. To capture all of this key information a new document has been introduced into the My Care Wishes folder called a ‘Personalised Shared Care’. A My Care Wishes folder supports choice around ‘care wishes’, so that all frail elderly individuals, those with long term conditions and/or mental health/dementia and their families have opportunity to be fully involved in their care. It does more than consider how someone wishes to die well. Within a care home setting, the My Care Wishes folder should remain in the resident’s room. This is particularly important in out of hours emergency situations, especially if bank and agency staff are on duty. It means carers will have all key information in the one place. The implementation of the Personalised Shared Care & Support Plan and My Care Wishes folder has been developed by both CCGs in partnership with local clinicians and the Suffolk End of Life Network, Suffolk County Council Adult Community Services (SCC ACS), Suffolk Community Healthcare (SCH), Primary Care GPs and both Suffolk Hospices. Click HERE to download a complete set of the My Care Wishes documents. You can view the Planning for your Future Care (Advanced Care Planning) booklet by clicking here. GP Practices and/or other healthcare professionals can obtain My Care Wishes Folders from West Suffolk CCG by emailing carol.king@westsuffolkccg.nhs.uk or by telephoning 01284 758052. If you would like any further information please email carol.king@westsuffolkccg.nhs.uk or telephone 01284 718052.